It's Sunday and time for the Sunday Release at DigiStamps4Joy. I decided to make two cards for this week's release. Hop on over to the blog and then to the shop to see what great digis are in store for you this week. Check out the great inspiration from my fellow DT members. For this image, I used two separate digis called "Just Add Wings" and the "Wings" digi to make this card. You need both images to make this complete image. Then I welded them in Silhouette. I used the print and cut feature to cut the digi out. I used Our Daily Bread Designs Vintage Flourish Pattern die and Christian Faith 6x6 paper collection. The image is colored with Wink of Stella glitter pen except for the skin which is done with Copic markers. The bow was tied using my Bow It All. Bling is by Want2Scrap. I popped the image with pop dots. It's Sunday and time for the Sunday Release at DigiStamps4Joy. Hop on over to the blog and then to the shop to see what great digis are in store for you this week. Check out the great inspiration from my fellow DT members. For this image, I used two separate digis called "Just Add Wings" and the "Wings" digi to make this card. You need both images to make this complete image. I welded them in Silhouette. I used the print and cut feature to cut the digi out. I am the hostess for Challenge 95 at DS4J. I chose "use a shaped card" as the theme. Hop on over to the challenge and see what great cards my design teamies have made. Then create a shaped card and share it with us. I decided to use my Silhouette to design my card. I found this cute baby girl dress and thought I would give it a try. For the image, I used Copic markers to color the baby feet. You can find this image in the DS4J shop online. I used Bazzill paper for the outfit. The flower is from a scrap. The bling is from Want2Scrap and the flowers are Prima. I saw a card made by Marie Gamber online and fell in love with the design. I shamelessly CASE'd it here with only a few minor changes. Thanks, Marie. I used a digi image from DigiStamps4Joy. You can find the image here. It comes both colored and plain. I colored it with Copic Markers and used some distress ink. I cut my image with the Silohouette print and cut feature. I also used the Spellbinders dies, a Matha Stewart punch and a Marvy punch. I added some bling from Want2Scrap. I popped both the image and the sentiment with foam tape. 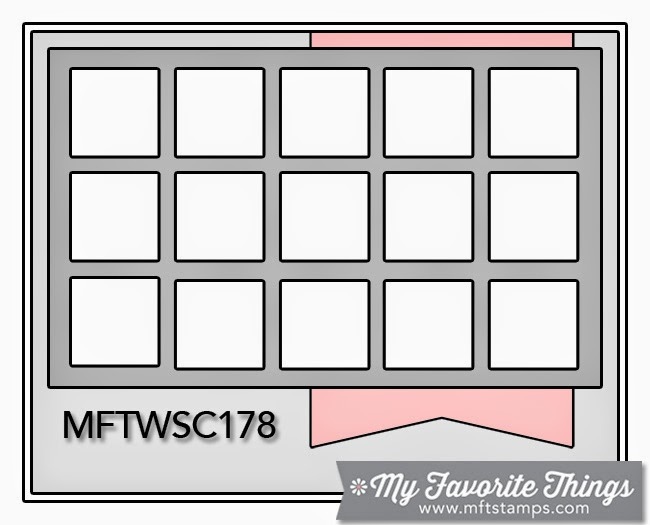 Since I haven't done a Sunday release card at DigiStamps4Joy for awhile, I thought it was time to get one done. I used this cute image called "Selena." You can find it here along with all the other new Sunday releases. This is my second card for Lady Ann's Christmas challenge. I used the same image from DS4J (Santa's Letter), colored with Copics. You can find the image here. This time I only used Wink of Stella for the snow background and on the fence and mailbox. I recycled the snowflake from a Christmas tag I made and never used. The sentiment is stamped directly on the satin ribbon. Both are from Michaels. The dp is from a 6x6 pad of unknown origin. It's Wednesday and time for the mid-challenge entries at DS4J. The challenge for these two weeks is hosted by our design team member, Pam. I am using an older digi for this card. It's called "I'm Sorry Fairy" and can be found in the online store here. It is from a series of three "fairy" digis. I cut the background with my Cameo, using Recollections cardstock from Michaels. The digi is colored with Copics as is the flower. The rhinestone bling is from Want2Scrap and colored with Copics. The brad is from my stash of unknown bling. The flower is a "Color Me Crazy" from Petaloo. They are all white and can be chalked, inked, painted. The die cut is a Spellbinders die. In anticipation of having enough Christmas cards to send out, I joined the DigiStamps4Joy Christmas challenge. I also joined Lady Anne's Christmas Card challenge (2 cards a month). I have kept up pretty much with the DS4J challenge, but have fallen behind in the other. 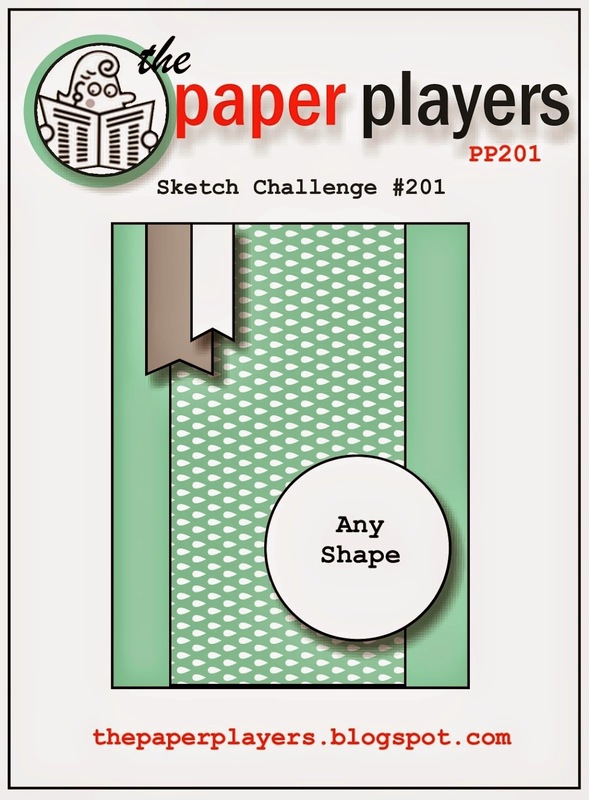 I decided to check Paper Playful for Christmas challenges to get some inspiration. I found Craftyhazelnut's Christmas challenge. So, I decided to enter it this time. I used the digi from DS4J. If you haven't checked out their Christmas challenge, do so now here. Send an e-mail to Desire and she will send you the image for this month. It's never too late to do so. For this card, I used red cardstock from Recollections, gold shimmer sheet, image from DS4J, ribbon from Michaels, flowers from Wild Orchid. I ran the gold shimmer sheet through the E-Bosser with a Tim Holtz Alterations Christmas folder. 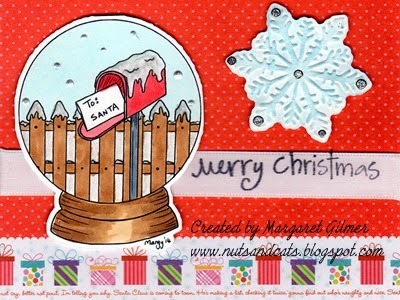 I used Wink of Stella glitter pen to color between the fence posts, Ice White Pearl Pen on the top if the mailbox and fence posts and White Opal Liquid Pearls for the falling snow. I colored the image with Copics. This sketch from Tuesday Morning Sketches just screamed masculine at me. I made four of them to put in my OWH box. I used Recollections cardstock and Bazzill patterned cardstock. The sentiment is from Stampin Up. Twine is by WRMK. I created this card completely using the Cameo. From the card base to the embellishments were cut and filled with color. The only thing not Cameo generated is the sentiment and sentiment tag. The image is by Dustin Pike. I love the center step card. I used the center step file from Cameo. The base was cut using white cardstock. I used the same file to cut the chevron dp from Bo Bunny 6x6 Enchanted Garden Collection. 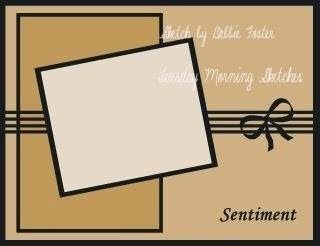 The sentiment panel is also from the same file. The stamp is from Our Daily Bread Designs. Butterflies are with a Martha Stewart punch and the bling is from Want2Scrap. I had cut the background on my Cameo a couple months ago and never could decide just what I wanted to do with it. I knew I wanted to put it on a "water color" card base. So it sat like that for a long time. When I looked at the Jackie's theme for DigiStamps4Joy for this challenge, I decided to do a beachy scene. I used the image "Beach Babe" which you can find in the online DS4J store here. I colored her with Copics and popped her with foam tape. The Smile sentiment is a stamp and the other one is computer generated. I really loved the sketch today on My Favorite Things. I wanted to make it, but I didn't have the die. It looked a little intricate, but when Pam Tetreault said she cut one on her computer, I thought I could do the same thing. I asked her for the dimensions and she tried to send me her file. Unfortunately, she had upgraded the Cameo so it wouldn't open on mine. In the meantime, I actually got one made. Here is my finished product. I used the K & Company dp on a white layer on a blue card. The grid is cut with Xpressit cardstock. The stars are from a pack I bought at Michaels a couple years ago. I cut the circles on my Cameo too. The lettering is a pack that I have had forever.